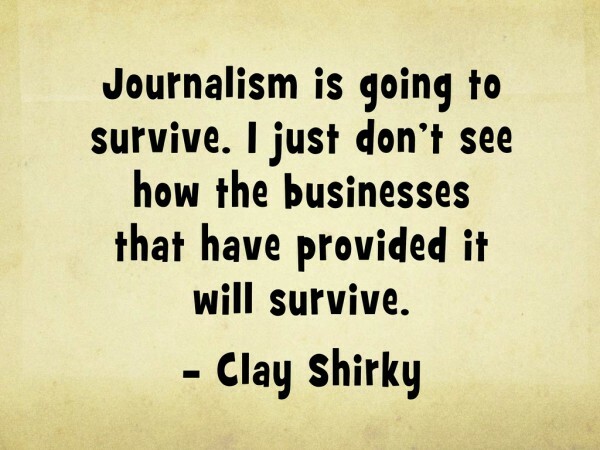 Clay Shirky — a professor in New York University’s interactive telecommunications program — writes, teaches and consults on the social and economic effects of the Internet. In a recent article titled “Read It and Leap,” The Economist discusses the challenges faced by The New York Times. “[I]t now finds itself in a multi-front, journalistic equivalent of The Hunger Games, battling stealthy youngsters such as BuzzFeed, the Huffington Post, Business Insider and Quartz,” it writes humorously. The reality is that while fictional people die off in each round of The Hunger Games, real jobs and market share die off with each round of plucky, journalistic upstarts. Chief among the so-called paper of record’s concerns, outlined in a leaked internal memo, is how to retain digital talent when promotions go to those with “inky-fingered backgrounds,” writes The Economist. (Example: replacing Jill Abramson with newspaper veteran Dean Baquet as editor.) While the Times is considered one of the nation’s top newspapers and perhaps has had the greatest success monetizing digital content, it too must be agile. One issue is that of “the wall” — a keystone concept of traditional journalism that separates journalists from editorial and business concerns. This division never worked 100%, but has long been viewed as essential to spare journalists’ reporting from commercial pressures. Yet, The Times notes that in today’s environment this wall between journalists and business concerns limits collaboration and thus opportunities to get news in front of larger audiences more effectively. “Even before filing a story, reporters could take part in a discussion of how to present, package and promote it to reach the greatest number of readers,” says The Economist. The theory of the Long Tail is that our culture and economy is increasingly shifting away from a focus on a relatively small number of ‘hits’ (mainstream products and markets) at the head of the demand curve and toward a huge number of niches in the tail. As the costs of production and distribution fall, especially online, there is now less need to lump products and consumers into one-size-fits-all containers. The existence of the long tail is one reason why brand journalism is so effective: you can literally produce news in any niche and find an audience somewhere on the globe. But can you keep it? In Web design parlance, “responsive design” means the creation of websites that can scale and functionally operate on any size screen, especially mobile devices. Similarly, all businesses, including news-driven ones, are discovering a similar demand. How can they scale profitably? How can they reach the right people the right way? How can they capture attention in a crowded space? How can they cultivate loyalty when abandonment is just a click away? Brand journalism isn’t a panacea for these business challenges, but, from a marketing perspective, cultivating specialized news can move in your favor. It is a bold departure for many businesses to realize the scope of competing voices and to start thinking creatively and competitively with their use of custom content. It’s a new reality and yes, it demands getting with The Times.